I did it! I finally did it! After months of wanting to plan a meet up for local Birmingham bloggers I finally set a date, booked a room, and met some lovely ladies. I'd been thinking about setting something up for quite some time really. 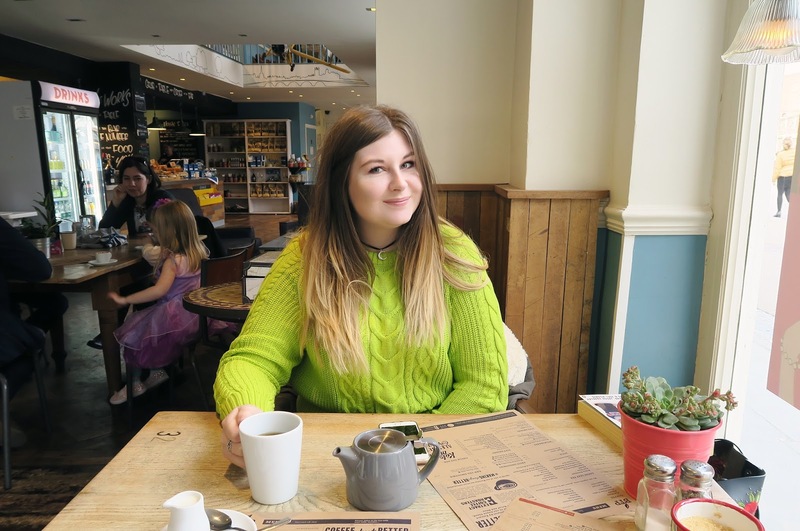 I've been blogging for over 5 years now and although I'd made some great blogging friends throughout the UK, I'd still hardly met anyone from the Midlands which was a shame. I always see bloggers and vloggers meeting up for coffee and photoshoots and to be honest I wanted in on that kind of friendship. Like I've said previously, not many of my friends know I blog and I'm quite happy to keep it that way as I don't think they'd really understand it anyway. But as I've kept my blog quiet I've also managed to partly alienate myself from local bloggers which is sad. So with that in mind I wanted to get a load of us together! 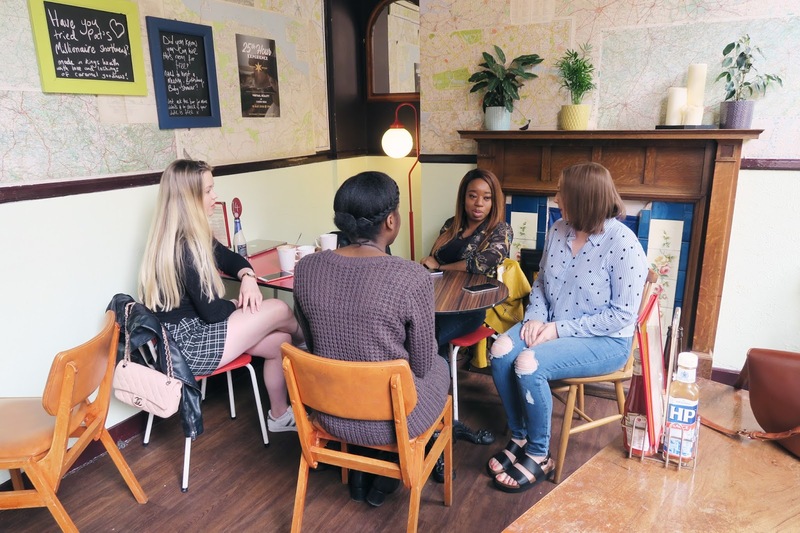 I do occasionally meet bloggers at events around the Midlands which is always fun, but at the same time the events are always so busy with constantly taking photos and promoting things on social media, you don't get time to really talk to people, to really connect. Along with that there are a lot of bloggers who don't really blog about 'things' and don't get invited to events because it's not relevant to them, and I'd never get to meet these people if not at a casual meet up like this. So I planned my little event. From left to right Giovana, Gemela, Shona, Jess. It wasn't without difficulty to be honest. I was nervous for weeks that nobody would turn up/ too many people would turn up/ the room I booked wouldn't be right. I worried a lot basically, but I persisted. In the end I booked a little room at Cherry Reds in Birmingham on the advise of the lovely Ting and it was just right. Four fab bloggers/ bloggers-to-be turned up, and although four was quite a few less than had said they were coming, it was a nice amount of people. We all managed to have a good chat over a cup of tea or two and it was just really great to sit and talk to creative people for a few hours. 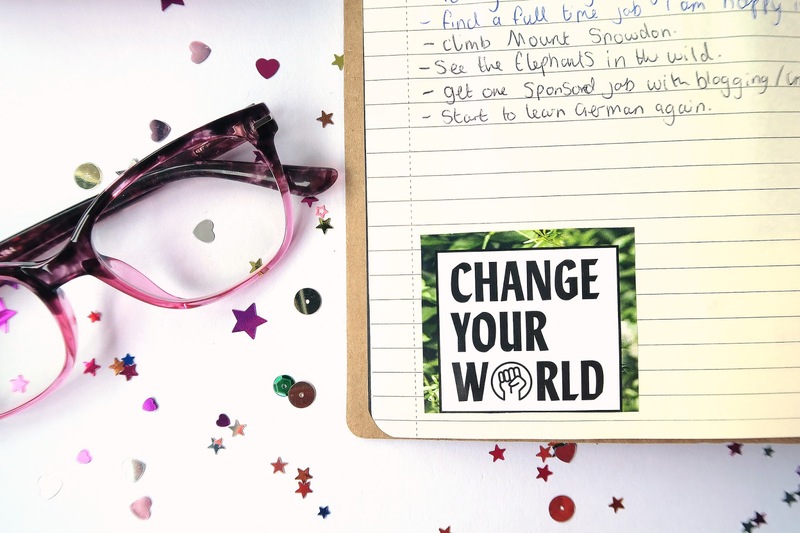 Along with just generally having a really nice time I also managed to tick off one of my blogging goals for 2018 and work towards overcoming my anxiety - something I will talk about again soon. I'm really really glad I plucked up the courage to put on the event and I can't wait to organise another! 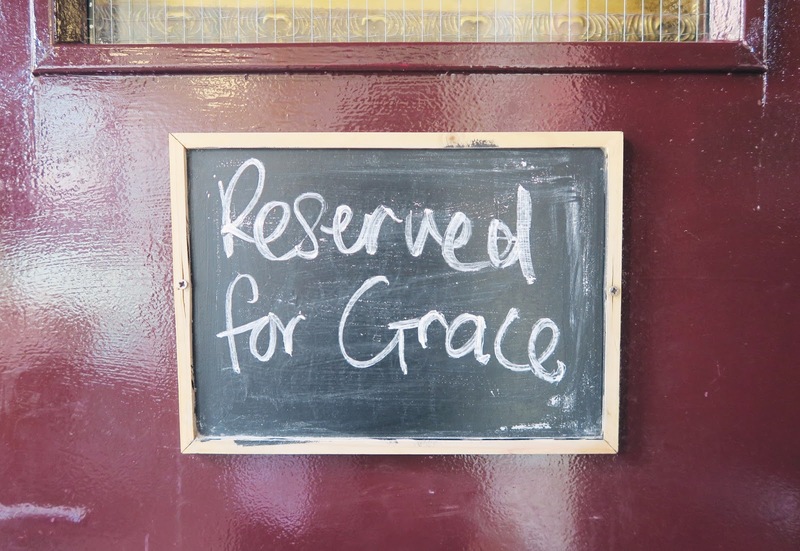 I HOSTED MY FIRST BLOGGER MEETUP! Wow! 5 years! Where has the time gone? It's been 5 whole years since I started this little blog and what a good few years it's been. Since setting up my blogspot all those years ago I've gained friends, skills, and so much confidence. The world of blogging has its ups and down but the good far outweighs the bad and I can honestly say this is the best hobby I have ever ever had! So why did I even start blogging? Well a mixture of reasons really. I was finishing off with my A levels and I had nothing to work on or look forward too. My education was finished as far as I was concerned and I wouldn't have a reason to create anything anymore. I loved being at college and the thought of just mindlessly drifting into the world of work scared the life out of me! Would I have a reason to take photos anymore? Would I even want to? So that was the kick up the bum I needed to get something set up. I was reading blogs well before this time though. Some I still read religiously, others not so much, but I'd gained inspiration from them all. When I started blogging 'influencers' weren't a thing. I followed girls who loved to write, girls who loved to take photos, and girls who could style up a bin bag if they wanted to. Everyone had a passion for what they did and I wanted a slice of that. I never picked a niche, if you read this blog post you'll know that I'm not a fan of just picking one thing and I'm so glad I made that choice. Maybe I could have specialised in something and that would have made my blog more popular but at the end of the day this is my diary, my life, and I want to record everything. So where do I see my little space in the future? Blogging is changing so so much. It's no longer about doing what you love and more about making everything perfect. Maybe thats a bad thing? I don't know, but I do know there will always be a place for old school bloggers like me and there will always be space for new bloggers too! 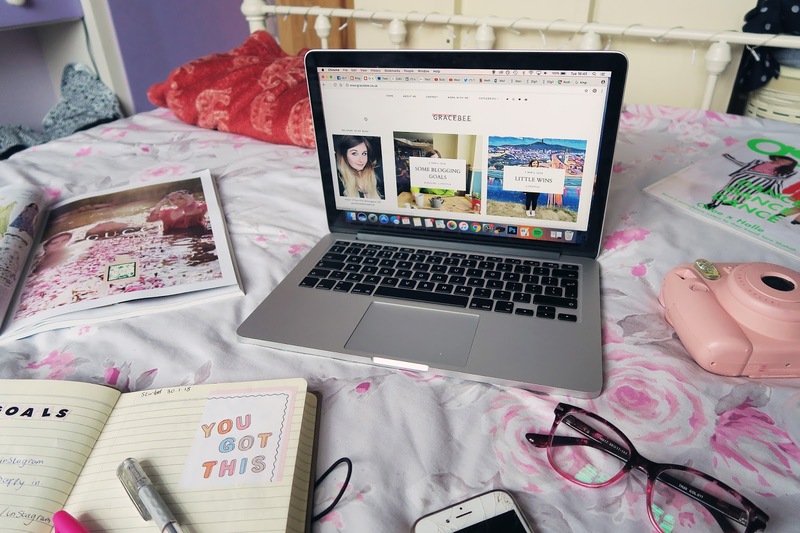 I never want to give up blogging and as long as I have the time gracebee.co.uk will always be where I come to share my thoughts, my feelings, and my life in general. Thank you so so much to everyone who has read my blog, left comments and just generally supported me in the last 5 years. It's been a blast! Here's to the next 5! I feel like I've been blogging forever - in a good way. It's been the best hobby I've ever had and the only one I've really stuck at. 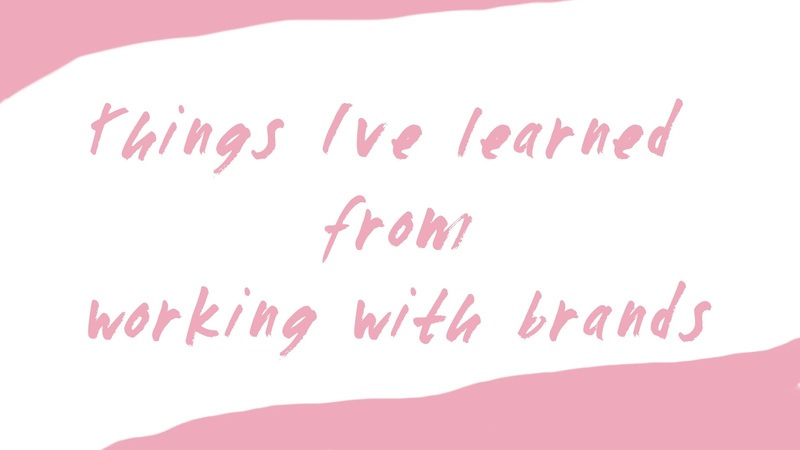 Through blogging I've made friends, developed my communication skills, worked with some great brands, and pushed myself to attend events alone. It's been a major factor in who I am today. I definitely don't plan to give it up anytime soon and so I thought I should probably set out some goals for the next year at least. I love blogging and I want my blog/ social channels to develop with me. - Get a sponsored job - controversial I know! - Finally organise the blogger meetup I've been talking about since forever! - Reach 2000 followers on my Twitter account. - Write more blog posts than I did last year. I wrote 91 posts in 2017 so it would be nice to write 100 this year! - Create a facebook page for my blog. So those are the goals I plan to work on in the next year! 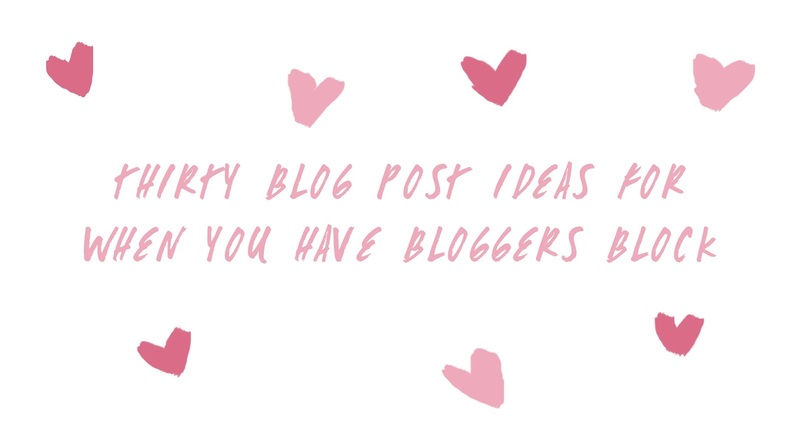 I know to many more established bloggers these aims must seem trivial but to me they are things I would really like to accomplish! 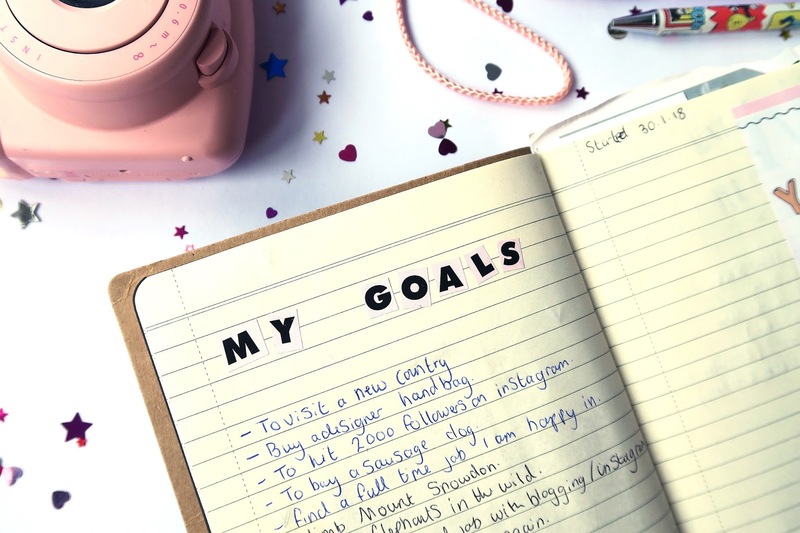 Do you have any blogging related goals at the moment? I'd love to hear them! 1. Face Of The Day - Similar to outfit of the day but a little bit easier as you don't need anyone else to take your photo! I've done plenty or these in the past, here is my latest one if you need a bit of inspiration. 2. Restaurant Review - I love reading a good review of someone's dinner and I definitely love writing about my own experiences! You can read my most recent review here. 3. Your Own Recipes - Can't afford to go out or don't want to? Whip up your own food and talk us through it step by step. This is especially good if you cook up something a bit different! 4. Product Reviews - Have you been using a product you are absolutely smitten with? Or did you buy something you bitterly regret? Tell us about it! I write reviews literally all the time, here is a recent post about a product I just couldn't get on with. 5. Blogging Tips & Tricks - If you've been blogging for a while you might have learnt a few things along the way. I lap up blogging tips and I know a lot of others do too! You can read some of my blogging tips here. 6. Whatever Is On Your Mind - Have a rant, talk about something you are passionate about! Get it all out and let the opinions roll in. I can't get enough of honest raw content, I think it's something blogging is slowing losing..
7. Your Day Out - Been anywhere fun lately? Write it up, tell us a funny story about it. 8. Photo An Hour - I've been meaning to do this since forever but life has just been getting in the way. 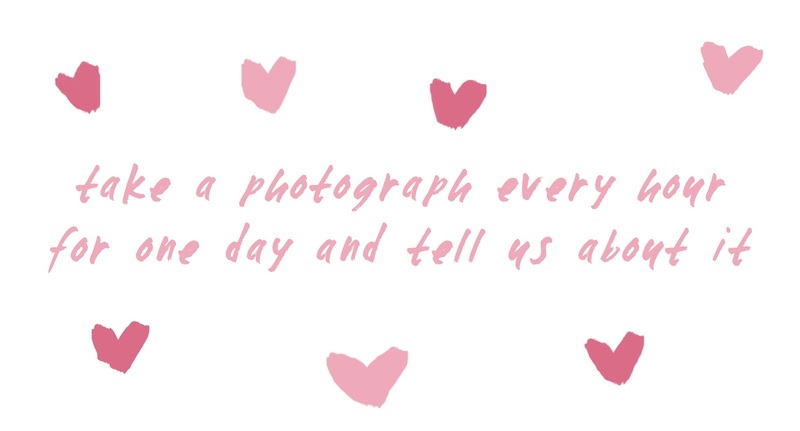 Just take a photograph every hour for one day and tell us about it. 9. Floor Outfits - If you don't have anyone to take your outfit pics just display it on the floor. Fold your clothes neatly, add accessories and snap away. These kind of photos do really well on Instagram so don't forget to upload it there too! 10. 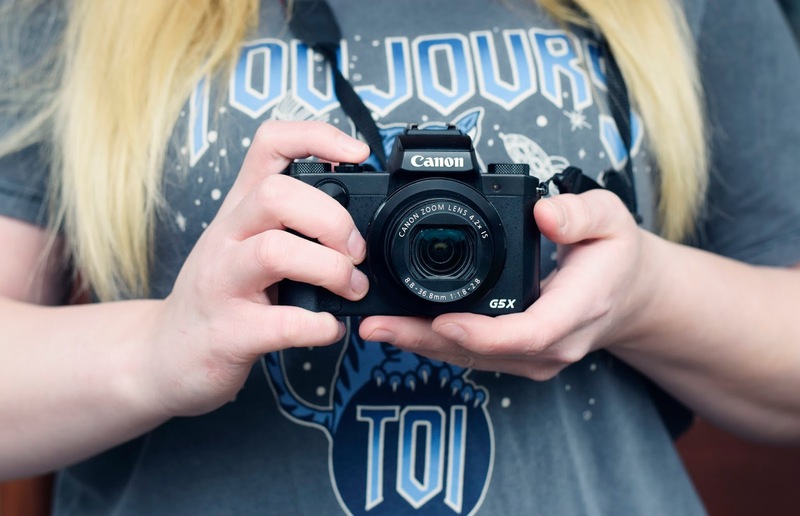 How You Take Blog Photos - Images on blogs are always a big thing for me. If your photography is good I'm probably going to stick around and if you have a post telling me all about how you do it I'm definitely going to read it! 11. Your Collections - Do you collect anything? Lipsticks, books, ornaments or even stamps! Show us your stash. Tell us about how your collection started, why it started and if you have any favourite pieces! 12. Daily Routines - Do you have a skincare routine, fitness routine or just anything you do on the daily without fail? People are nosy, they want to know. 13. Travel Diary - If you've been on holiday lately you should write a day to day diary of what you did. If your blog is more image than text based do a photo diary! If you fancy a butchers at my travel diaries you can find them here. 14. Travel Plans - If you haven't been away tell us where you would love to go! 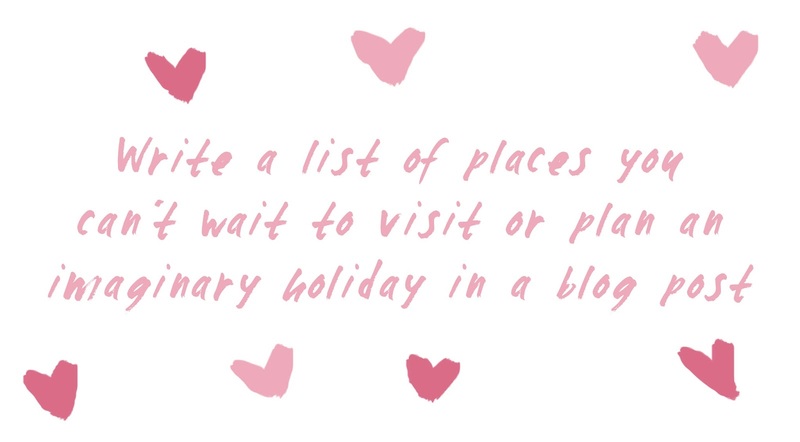 Write a list of places you can't wait to visit or plan an imaginary holiday in a blog post. 15. Seasonal Posts - Is Christmas coming up? Or is Valentine's looming? Do a gift guide, tell us what you are planning to do on the day or if you hate that particular holiday tell us why! 16. Pets - Everyone loves a cute animal, I know I could spend hours looking at puppy pics! If you have a pet I'm sure you have a thousand funny stories you could tell about them. 17. £20 Outfit Challenge - Grab your friends and a little bit of cash and head down to your nearest charity shops. You have £20 with which to find a whole outfit! Blog or Vlog about it! You get some funny content and the charity gets a bit of money, everyone wins! 18. Room Tour - I literally love room tours! 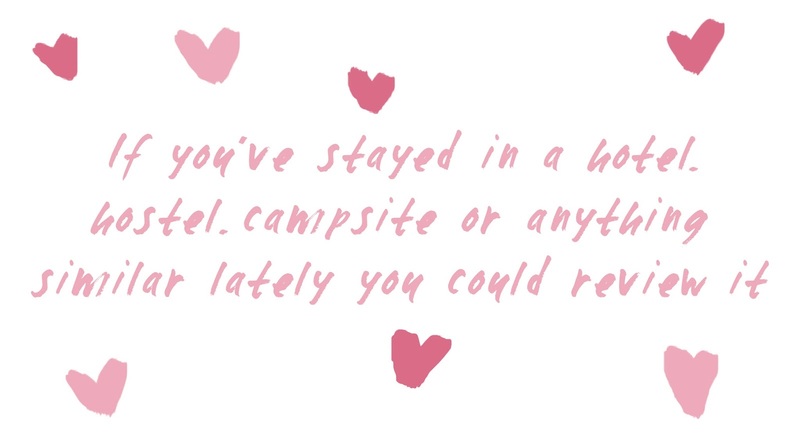 I think its because I'm super nosy but I can't get enough of seeing how other bloggers live! 19. Go For A Walk - Get out, leave the house, take your camera with you. If that alone time doesn't help you think up some new content then post the pictures you took, you can't lose. 20. Wishlist - I post a wishlist every few weeks packed full of all the things I'd like to buy. I know I'd never be able to afford half the things on there but it's nice to dream. 21. Storage Ideas - I really like to see how others store their makeup, jewellery and other bits and bobs. It's easy to let things get messy so I occasionally scour the internet for storage tips. You can see my jewellery storage ideas here. 22. Collaboration Posts - Struggling for ideas but have a few blogger friends? Get together and brainstorm. You could do one collaboration post together or even make a series out of it. You might have seen my latest collab with the lovely Amanda which we love posting every month. 23. Theme Makeup - If you have an obsession with makeup but don't really try new things out that often, why not give a themed makeup look a go? A few months back I tried my hand at some pokemon inspired makeup and although it's not my best look, I enjoyed doing it! 24. Events - I post a lot about events or days out and I do love reading about a good blogger event too. I know not everyone will be able to go to one of those but I'm sure there are lots of other things happening near you. 26. Tags - I'm forever being taged in new things and honestly I really do love taking part in them. If you haven't been tagged in anything don't worry, just make you own tag up! 27. Hotel Reviews - If you've stayed in a hotel/ hostel/ campsite or anything similar lately you could review it! Just make sure you have a couple of good images to go with the post. I recently posted about my hotel in Warsaw which was just gorgeous. 28. Hauls - Everyone loves a good haul, we all just like to be nosy and see what people have bought. If you've picked up more than 4 or 5 items in one go, snap some pics and show us what you got. 29. Budgeting Ideas - If you are pretty practical with your weekly wage or if you just know how to get some good deals tell us. I really like to see how people budget and I'm always looking for discounts online so if you know a few tips, tell us! 30. What's On Your Phone - Do you have apps you can't live without or is there a game you're addicted to? Tell us about it. Sometimes I think these kinds of things would be easier to talk about in a video but a blog post could work just as well. 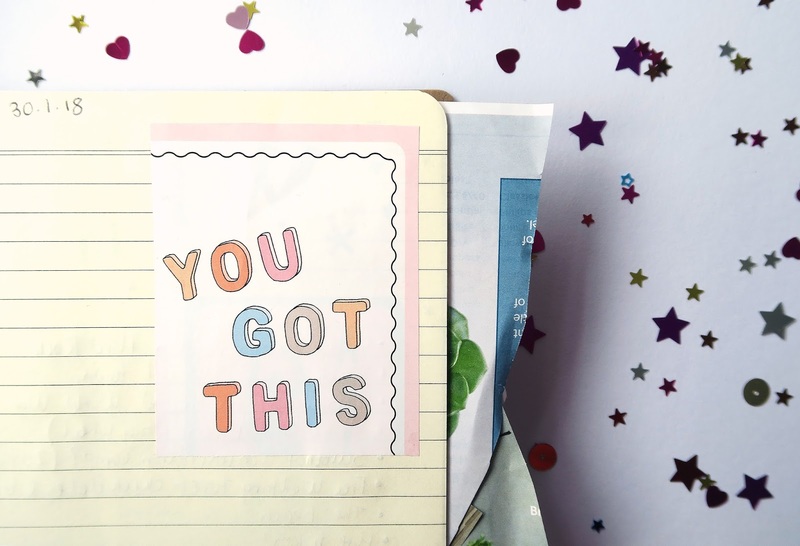 So I hope these ideas will come in handy for any fellow bloggers facing the dreaded writers block. If you have any other post ideas I'd love to hear them, either leave them in the comments or tweet me! I've been blogging for almost four years and in that time I've been lucky enough to have worked with some fab brands. Whether it's been reviewing a new product, being featured on their site or putting together a style guide for them, I've worked with all kinds and I've learnt a lot in the process. There's been a lot of opinions on bloggers getting 'freebies' or being paid for sponsored content lately, but honestly who cares? If you want to try that new product out or you could do with a little bit of cash go for it! As long as you are always honest and it's relevant to your style of blog I don't see the problem. Bloggers put a hell of a lot of time into their blogs so I don't see why they shouldn't get some perks. Sometimes a brand will get in touch and they don't quite fit in with your style. It's okay to turn down their offer. They will find another blogger and you won't feel like a sell out. On the other hand a company might ask you to work on a project you like the sound of but their budget might be a little low. 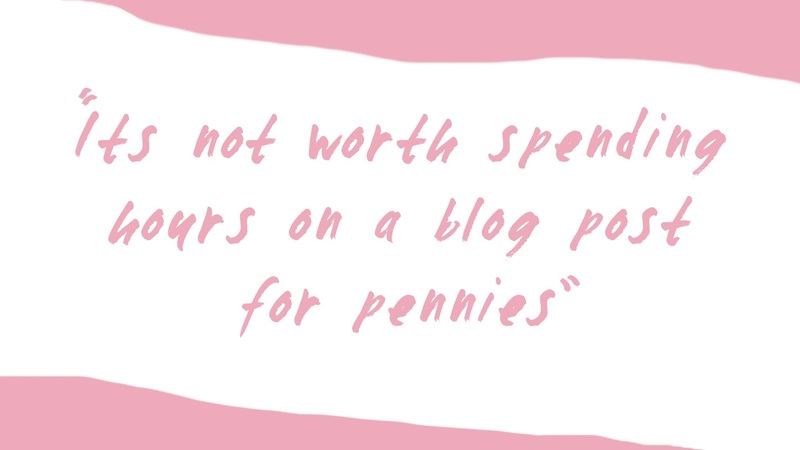 As a blogger you have to understand that sometimes companies look at us as a cheap way of advertising and it's not always worth spending hours on a blog post for pennies. I've been asked to write posts for as low as £4 and honestly I think its a bit of a piss take. PR people spend a lot of time looking for the right bloggers for a campaign. They might have looked at hundreds in one day and if they send a personalised email to you I think it deserves a reply. They won't expect to hear back every time if they've sent out thousands of generic emails but if they've took the time to address you specifically or even mention a particular blog post, you should take the time to email back. I also don't think it hurts to be nice and ask them how their day/weekend/ holiday has been as well. Building business relationships is important but it's just as - if not more - important to be friendly and polite. If you've been gifted a product to review or feature on your blog/ social media, you should do just that. PRs will be nagged by their managers if they've sent products out without results. They might send you a friendly email asking when you will feature that product and you should always be honest with them. If you can't feature it for a couple of weeks, let them know, at least then when their manager asks they can say you've been in contact. You might not be given opportunities by the same PR company in the future if you go AWOL after getting 'freebies'. 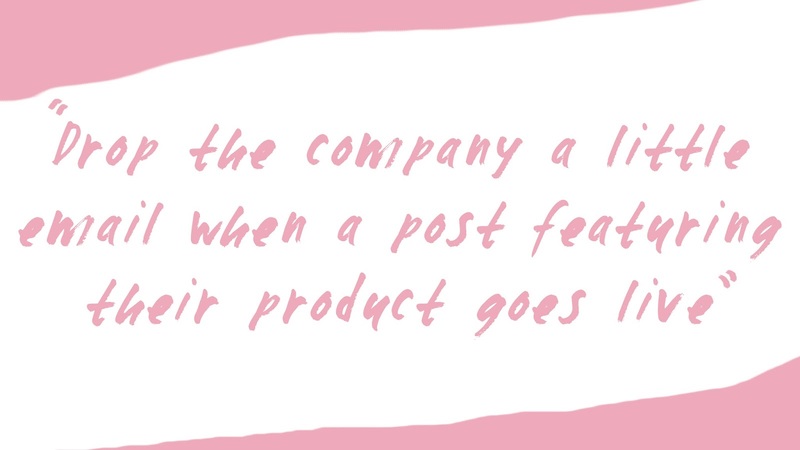 Along the same lines I always drop the company a little email when a post featuring their product goes live, they might not care but it's good to keep them in the loop. Lucky for me I don't have any horror stories to tell but I always think its a good idea to read the terms when working on a campaign. I'm working on something right now which, when it goes live, the company has the rights to use any photographs featuring the product. I agreed to this at the start but if you don't read through things properly when you sign up, you might have a nasty surprise later down the line. Even though us bloggers do spend a lot of time and energy on our content we are lucky to be given some opportunities. I think it's important to enjoy the experience and take pride in the work you create whether it's paid or unpaid. So that's about everything I can think of right now. I don't claim to be an expert blogger but I've been on the scene long enough to have picked up a few tips that you guys might find useful. Just a side note, I've put the word 'freebie' in quotations as we all know there as nothing free about products gifted to us for promotion. I really hope you liked this post and I'd love you to get in touch if you have any tips when it comes to working with brands!